The idea of joining throngs of hyped up shoppers the day after Thanksgiving has never appealed to me. I’m not much of a shopper to start – I can barely stand grocery shopping – and I don’t do well in crowds. For all my adult life, I have lived in places where it is easier to get into the mountains than it is to find a mall; this is one of the many things for which I am thankful – on Thanksgiving, Black Friday, and all the other days. Far from the madding crowds: scoping out a new season. While the hoards of Black Friday shoppers rise early to stand in line, my family, if all goes well, will be making our way to the mountain for opening day of ski season. When there is snow on Thanksgiving weekend, I ski. That has been true since my immediate post-college years when I lived in Crested Butte, Colorado. During those ski town days, I usually spent Thanksgiving working, then joined friends – and friends of friends – gathered in someone’s living room for a hodgepodge of holiday dishes and traditions around a makeshift collection of card tables and mismatched chairs. Most of us were far from home and family, working odd holiday hours in a town where shops, restaurants, and ski lifts were open on Turkey Day. People showed up when they could, after or between shifts, coming together in the comfort of good food, friendly company, and talk about the fresh ski season. Back then I was thankful for being in the mountains, living in a beautiful place with other people who embraced that beauty and loved exploring the wide-open spaces around us. I was happy to have a job that included daily ski breaks, a decent place to live, and people to gather with on this holiday of giving thanks, even if they weren’t quite family. I’m not sure I even knew about Black Friday until I moved back East. Maybe I wasn’t paying attention before. Or maybe this national day of shopping has morphed in the past couple of decades into the consumeristic beast it is now. In the modern era of constant connectivity, you don’t even have to leave the house to buy presents, and online shopping has its own special holiday in Cyber Monday. Well before Thanksgiving, I started receiving texts and emails touting Black Friday and Cyber Monday sales, sometimes from stores where I’ve never even shopped. They can send all the advertisements they want, I still won’t be buying today, and probably not Monday either. My holiday shopping tends to be on the small scale (even with three kids) and as local as I can make it. During the Black Fridays I worked as a reporter, I spent a good portion of the day after Thanksgiving popping into those local shops in the post-parade crowd of Main Street Littleton, talking with local business owners and shoppers. The resulting story was generally a combination of fluff (what were the “hot” items this season) and substance (how important were Black Friday sales to these small shop owners). Surrounded by hustle and bustle, and jotting soundbites into my reporter’s notebook, I longed for the steady hum of the chairlift’s bullwheel, the sensation of skis slicing through snow, the comfort of not being corralled into small spaces with so many people. (My claustrophobic exception is the tram car, where the end result of a top-to-bottom run absolutely justifies the sometimes crowded means of transport). Lots of things have changed since those early post-college years, geographically and otherwise. My Thanksgivings have returned to a more traditional scene – a day off from schedules, gathering with family, eating too much. 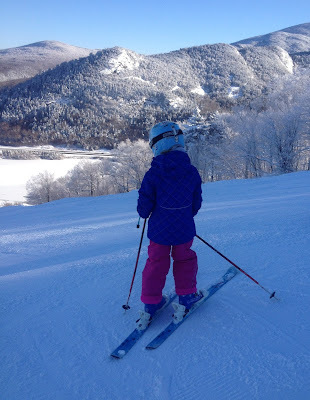 These days, I spend my winter weekends coaching 6- and 7-year-old aspiring ski racers. We kick off the season the day after Thanksgiving. It turns out I am thankful now for some of the same things I was thankful for 20 years ago when I lived in the mountains of Colorado: work that allows me to ski quite a bit, a pretty nice place to live with the beauty of the mountains surrounding me, and the closeness of family. Plus, I get to spend Black Friday on skis. Original content by Meghan McCarthy McPhaul, posted to her Blog: Writings From a Full Life. This essay also appears as Meghan's Close to Home column in the November 25, 2016 edition of the Littleton Record. November and I have a touchy relationship. I could do with a bit more light and a lot more color than this month has to offer – or a quick switch to cold and snow, without the in-between damp chill and bare trees. It is my least favorite month. But there is one thing about November I like: the weekends. 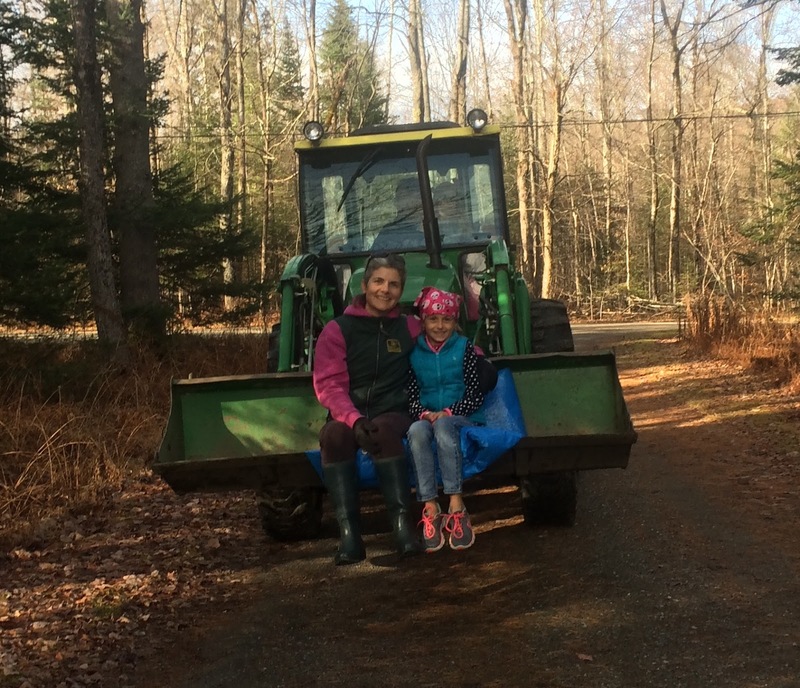 Getting things done, November style. My September and October weekends were chockfull of soccer games and Saturday meetings and short road trips to visit out-of-town relatives. Every weekend seemed to have some lengthy commitment – whether fun or purely obligatory. And a few weeks from now, my family will dive into our weekend ski routine. If you’ve read this column before, you know I love skiing. But winter is a long-haul season of full days in the cold, coaching on weekends, and getting kids up and out early seven days a week. While I am looking forward to the start of ski season, I am also appreciating this relative weekend downtime for the short while it lasts. On November weekends, there is wiggle room. Time to go for a meandering morning run or meet up with friends or linger at the table with a second (or third) cup of coffee and some reading. The kids can do as they please – stay in bed with a good book, scout out potential new bike trails in the woods, run around the yard with the puppy. These November weekends give us time to catch up and regroup. 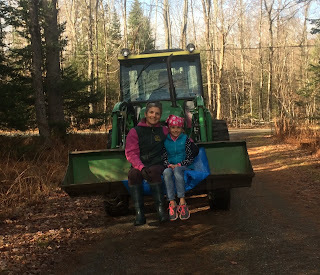 Last weekend, as I was hauling the winter clothing out to determine which kids (all of them) have outgrown which gear (most of it), I also – finally – put the leftover summer stuff into winter storage. We haven’t been swimming in ages, but in that slow shift from summer days to fall, there seemed a lingering chance we’d see one more hot afternoon and head for a dip in the river. By the time the seasons had fully transitioned, I was too deep in the thick of back-to-school, homework, and soccer chaos to notice the bag of beach towels and swim goggles still hanging in the mudroom. Winter, of course, has infinitely more gear than summer. Instead of flip-flops and bathing suits, there are heavy fleece layers, hats and mittens, wet snow boots, and bulky coats – not to mention skis and ski boots and helmets and goggles. Each November I have to figure out again how to make it all fit into the designated space. Each year, as the kids grow, it seems that space takes over more of the house. It takes all of November’s weekends to make the transition from the last season to the next. We spend time cleaning out the gardens, picking up the yard, finishing up any warmer-weather projects that have loitered through the summer and fall. But the chores are fit into space with comparatively fewer time constraints than we had a few weeks ago and will have again by the end of the month. Come the day after Thanksgiving, we’re on the slopes. Then comes the rush and full-bore excitement of Christmas, followed closely by our family’s two straight months of birthdays to celebrate. Winter weekends are fun, but very full. And they’ll be here soon enough. For now, I am stuck in November, a month that will probably never be my favorite. I could easily skip its Mondays-thru-Fridays. But I’ll take what I can in the freedom of November weekends. Original content by Meghan McCarthy McPhaul, posted to her Blog: Writings From a Full Life. This essay also appears as Meghan's Close to Home column in the November 11, 2016 edition of the Littleton Record.